Enjoy the beauty of the magnificent Black Hills of South Dakota at Broken Arrow Horse and RV Campground! If you are traveling with horses, the fantastic amenities here can’t be beat! Whether you are driving the RV, looking for comfort in a cabin, or want to rough it in a tent, you will find your perfect accommodations at Broken Arrow. Only minutes from some of the Black Hills most popular attractions and sights, this is a great place to relax and unwind between adventures! Campers at Broken Arrow have their choice of RV sites, cabins, and primitive tent sites. RV sites are offered with water and electric or water, electric, and sewer. All RV campsites are pull-through level sites that include a picnic table, drinkable water, a fire ring and access to a dumping station. Tent campsites are located under the shade of pine trees and include picnic tables and fire rings with cooking grates. The tenting area is close to the bathhouse and the Camp Store for convenience. If you’re looking for something more comfortable, multiple Cabins are available for rent. Cabins can sleep between 2 and 4 people and include a private bath, kitchenette, heating and A/C, TV/DVD, table and chairs, covered porch with grill, picnic table, and fire ring. All guests can enjoy a convenience store, laundry facilities, a playground, restrooms, showers, and free WiFi. Broken Arrow offers fantastic facilities for those camping with horses. 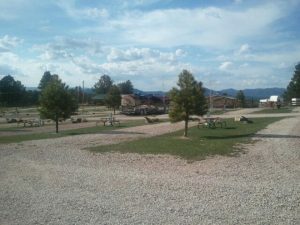 The campground features 100 covered stalls in barns, warm up pens, horse trailers for rent, hay and shavings for purchase, and wheelbarrows and shovels for cleaning. Golf carts are also available for hauling tack to the barns. Those looking for a beautiful place to hike, explore, and view wildlife won’t want to miss nearby Custer State Park. After taking a drive and enjoying the sights, be sure to stop by Sylvan Lake to cool off! Jewel Cave and Wind Cave National Park offer exciting cave tours, and those interested in history will want to check out the 1881 Custer Courthouse Museum and Mile Old West Town. Relax on an 1880 Steam Train Ride after a day of adventure at Mount Rushmore, Crazy Horse Mountain, and the Mammoth Site. And don’t forget to stop by the Wild Horse Sanctuary after a day on the trails! Other popular activities in the are include swimming, boating, kayaking, fly-fishing, biking, bird watching, off-roading, golf, and panning for gold. 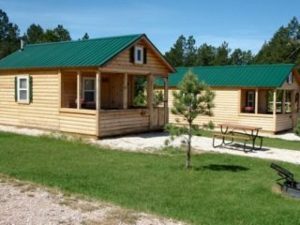 If you’re planning a family vacation to the gorgeous Black Hills of South Dakota, Broken Arrow could be your next camping destination! Perfect for equestrians and adventurers, this campground offers room to spread out and relax and as well as easy access to popular South Dakota attractions. Book your stay today on Camp Native!